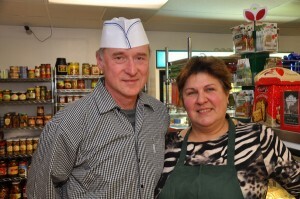 European Market Deli & Café has been serving European food to the residents of the Bay Area for almost a decade. We are a family owned business, concentrating on European foods – both imported, and made locally from European recipes. Most of our customers come from Castro Valley, Pleasanton, Dublin, Hayward, Oakland and Fremont. The “Market” part of our company imports foods from Bulgaria, Denmark, Finland, France, Germany, Holland, Latvia, Lithuania, Poland, Romania, and Russia, to name just a few. We also buy European style foods from local vendors – for example, if you are a bread aficionado, you should try our Swiss Bread – it’s a locally made wheat and rye bread – many of our customers say this is the closest to a true European bread you can find anywhere in the Bay Area. In the “Deli“, we make European foods ourselves – using traditional European recipes, we make soups, salads, European style potato salad with chicken breast (Salad Olivier), hand-made pieroshki, potato or meat cutlets, and many, many other foods. Naturally, we also have pastries – European style. “Café” part of our business lets you savor the foods and pastries right on the premises – we have a small dining area for our customers. You can use if to have a full meal served hot from our kitchen, or grab a quick lunch, or have a leisurely conversation with a friend, while nibbling on European style pastries. Catering – we offer full service catering – if you wish to have European food catered, please contact us. We have catered events in the entire Bay Area – from San Jose to San Francisco, and all over the East Bay. Whether it is a birthday party, or a corporate retreat, no event is too small or too big. Call us for special pricing 510-889-1223. We are conveniently located at 20912 Redwood Road, only 2 blocks from the I-580 and the Castro Valley BART station. With the newly opened I-580 on-and-off ramps, you can quickly get in and out. We are open 7 days per week. If you have any questions, please feel free to call us at: 510-889-1223.